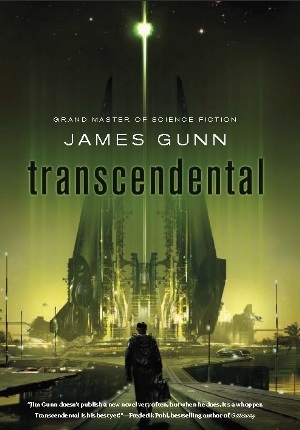 A group of aliens and a couple of humans set out as pilgrims aboard a ship and travel into deep space to find the rumored Transcendental Machine, either to claim it for their own species, or to destroy it entirely. Some plan to kill “the prophet,” the only one who knows how to get there. This story has been referred to as a scifi Canterbury Tales, and since I have not yet read The Canterbury Tales, I can’t really confirm or deny this. To me this story felt a bit like a scifi murder mystery. A bunch of people/aliens confined in a space ship all with their own agendas. An alien dies…who did it? As the story progresses toward this mysterious Transcendental Machine, we learn the back stories of several aliens, that is, if those back stories are even true – aliens lie too. The cool thing about this is that it essentially chronicles the evolutionary and social development of each species and how it achieved the sentience and knowledge necessary to join the Galactic Council. My favorite of these was the flower child alien, but there was also a pachyderm, weasel, and an artificial intelligence kind of machine, all with interesting backgrounds. Now there were moments where these stories were a little slow, but by then they were almost done anyway. The human characters were equally interesting, especially once you learn where they come from and why they’re on this journey. I loved the aliens in this and how completely alien they truly were. The flower communicates by swishing its fronds. How cool is that? Everything alien in this story feels completely foreign, especially the things encountered on their way to the machine. That part of the story was the most exciting, and as you near the end it gets really good. Despite some criticism of the ending by some people on goodreads.com, I was happy with it.